Holy Cow: More Than Your Average Burger Joint! Holy Cow looks like a coffee house, and it’s got a friendly, neighborhood spirit that’s similar to many community cafes. What’s more, a portion of every sale at this place goes to local charities of the customer’s choice, which means that you can feel good about everything you eat here. 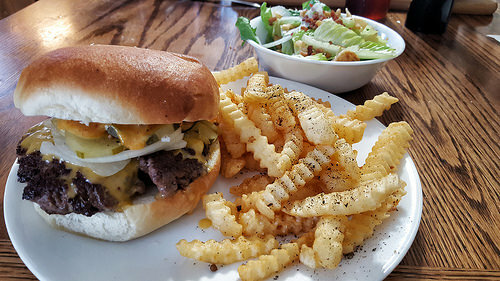 Unsurprisingly, Alexandria officials have bestowed small business awards on this local eatery, and DC area food critics have also named it one of the best burger joints in the DMV. Part of Holy Cow’s appeal is its flexibility — this place serves burgers to suit just about every appetite and palate imaginable. You start by choosing your meat (beef, chicken, turkey, tuna, hot dog, or quinoa veggie patty), cheese, bun, and toppings, if you want to build your burger from scratch. If not, just choose from the menu’s list of signature sandwiches. Two of the most popular are the “Sacre Bleu” (brie, bacon and truffle honey burger on brioche) and the “Steak House” (a burger topped with bleu cheese, spinach, mushrooms and onions).